Make sure your laser power line (the red or black) is not touching or wrapped into the set of wires running to/through your motors. It causes a huge amount of interference. I have found though, if you have your power wires wrapped in silicone tubing, especially the red line, it blocks almost all the interference that gets fired about. 9 1/2 hours to etch this in (and 4 changes of ice packs to my coolant reservoir). Mainly for portfolio purposes...and it was an idea for a gift. I may just keep it and make a second one for my brother since I like this one so much. That is beautiful!! WHAT IS THE DARK AREA AROUND THE OUT SIDE EDGE? Tell me more about this ICE packs. How hot do you get it ? My red wire is Okey but my black one runs to my gauge panel and back through everything to the laser tube. I'll try the silicone tubbing thing. Do you think shielded cable would be good? Do you think having the power supply where it is at is okey? I'll try both wires just to be safe. Yeah your placement of power is fine. That's no big deal. The dark edge around the glass was on there when I found the glass (found it in the recycling depot where I dig up all my testing materials). I know that you can buy spray on 'glass frosting' effect so I think what a guy could do is frost the glass first using a mask to make the border. Then once the frosting was dry, spray on a layer of grey paint so that the 'frost' effect remains visibly on the other side then simply add the grey contrast. It's what I'm going to experiment with next time to try for a DIY effect. 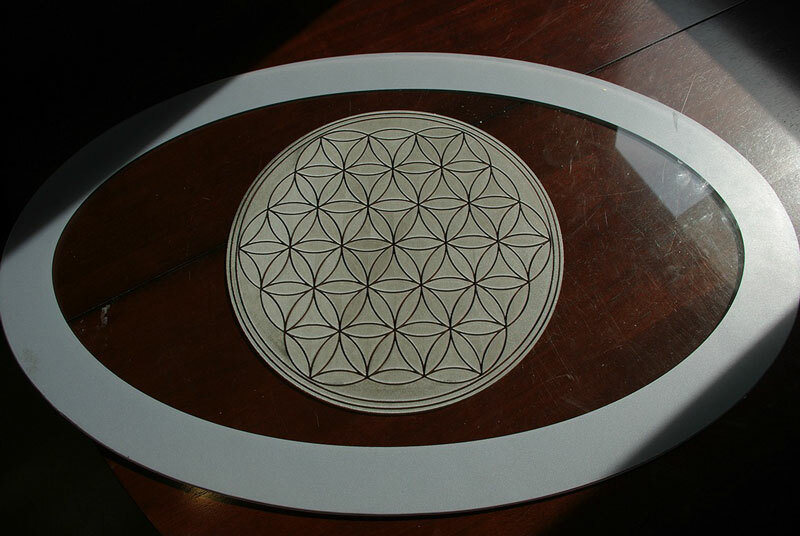 Tomorrow I hope to do an inverted version of the Flower of Life on a mirror. I'll post results. By the way, the way I did the vector fill was after hours of messing around to get the proper result. It was using a "vertical hash fill" with a tool diameter of 0.009 inches. I've tried inset, outset, horizontal and only vertical made the perfect effect without making ugly marks. It's as close to sandblasting as you can get. Unfortunately, it's also time consuming. This was also done using masking paper with full air assist to blast the adhesive out of the glass (if you don't it makes ugly burn marks). This is the masking I use and it has been working great. I think I have one of my problems identified. 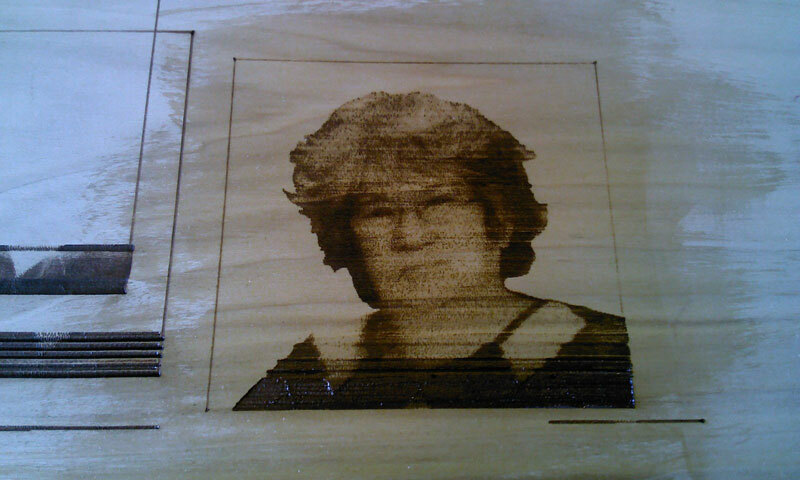 I ran the program with the laser off using an ink pin and it did not skip a line. There is some kind of interferance with the laser and my stepper motors. I have the laser power supply mounted in the box at this location. Would this be a possable problem? What can be done that might help me? Also when I am running in TTL low the laser will fire before the start button is pushed I have been using the key to controll at this point. I was wondering what could be done? I don’t see any problem with the positioning of your laser PSU but the black wire from the tube’s negative connection should be shielded for the distance it runs with other cables to your control box and back to the PSU. The shield of this cable should only be connected to GND at one end (preferably the PSU end). You may also want to look at routing your mains voltage cables separate to the other wiring. It appears that the trigger input to your laser PSU is TTL(High) so this is how the Mach3 trigger signals should be set (Active High). If this causes a problem then you could make up a small circuit using just one TTL inverter gate and convert the trigger signal to Active Low but I am not certain this would be of any advantage to you at this stage. 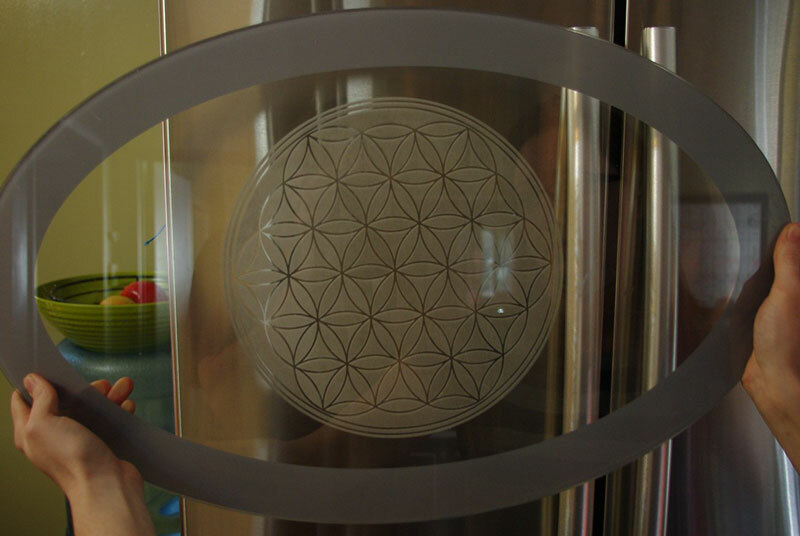 Laser engraving on glass produces tiny micro-fractures which initially refract / reflect the light well and the work appears a nice white in colour. Unfortunately, these micro-fractures also tend to be hygroscopic and they can eventually not refract / reflect the light quite so well resulting in the work turning darker in appearance. Obviously relative humidity can play a big part in this process but you may want to consider sealing the work (clear or coloured) shortly after it has been produced to help prevent this happening. Thank you tweakie, appreciate the advice. I'll look into giving the work side a spritz of clear coat while the mask is still on it to keep it protected. Will distiled water work for cooling my laser laser??? I am unable to find de-ionized water. I am from Montana It is a suburb of the USA and it might have to be fraighted in here. Distilled is the next best thing yeah, it's all I could find myself so it's what I'm using right now. Distilled + a smidge of antifreeze since I couldn't find an alternative to killing the algae in my system. I don't see why distilled won't possibly be a little better than deionized. Distilled is condensed from steam, and can have no minerals to coat your laser tube. Deionized water should also have no minerals, if properly produced, but it may have traces of other contaminants. It is considered not as pure as distilled by some people. Distilled is usually more costly to produce. Interesting John...that does make sense when you write it out like that though. Well that's better, I got some of the skiped spaces reduced. I removed the electric wires for the laser- and put them in a metal flexable conduit away from every thing. Its a lot better but it still seems not right. Now there is a real good chance I don't have a clue what I'm doing. But I am pritty good at it. Here is a video of it doing something. 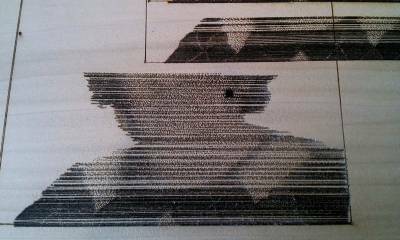 Also I might have something set wrong in Mach3. Or maybe something is set wrong in PEP4. Or something is set wrong in my Machine. Or maybe I forgot to pay my phone bill. I just don't know. I think it's time to get away from this for a while and maybe it will be okay on my return. Hey, that's progress - still a way to go but I think we all started out like that so keep at it and things will start coming together. Just a suggestion but it may be an idea if you try engraving / cutting some .dxf type shapes and outlines, text etc. This should show if you are missing / gaining motor steps and perhaps give an indication of what is required to get the Mach3 setup and your machine at optimum performance. Haaa Horay Yaa I think I got it!!! Do you want to know a dumb thing not to do. Do not ever wire tie the grounded part of the laser ( - ) line to your Y axis motor mount. It will make your machine do goofy things. I want to thank you all for all your help. Now I will need to figure out how to make BobCad to work with mach3 ??? I am not sure it is possible . Glad to hear you're getting somewhere! Yay! I know there is a buncha people in buildyourtools.com forums that use BobCad + Mach 3. It's definitely possible you just need the appropriate Post Processor when you generate your G-code. Bobcad wants $350. to sign up for a year Tec Support to get a post and I can't afford it at this time. I can't figure out how to start mach3 with the laser off. I changed Config, Ports and pins, Motor Outputs, Dir Low Active and Step Low Active both ways. I does switch the laser on and off but it somehow needs to know not to fire the torch when mach3 loads. Is there some way to tell the software to not turn on the laser when you start the program? Thanks Dave I'll check it out. As M3 is starting, and before starting, a pport can be in an undetermined state, and it can change state as M3 loads. Good operating practice is to always start M3 first, then power up your cnc controller, and only then power up all other units (spindles, lasers, etc.). Don't just rely on M3 and relays - always use physical on/off switches, too. The only thing I start first is the X box 360 because it will not start with M3 on (it is my controller for axis movement). But M3 is started next and when I start the machine the laser is on untill I run the program Then it is great. So I turn off the key untill I hit cycle start.and all is good. That is why I had the bad corner we talked about earlier. I am giong to laser the picture I show on post #179 If it comes out as good as that one I am going to inter it into the fair. If it doesn't I am entering that one. So far I love this program keep up the good work. I will mess around with how I start things and See if I can make it change. Also I might try to reverse C0.000 and C-0.0254 in the program and change my motor outputs C to active low. but I dont think it will be different. What I do, I have a "laser off" g-code I made which is basically just runs through Mach to make absolute sure my laser is off software/board wise. Then I turn on my laser PSU and pumps to get rolling after that. That way it always sticks. I've got a super nice BoB and I still get flaky behavior sometimes.